Summer means different things to different people. To some, it's the season of shorts and summer dresses, others get excited about beach time and pool parties, and then there are those like me who get excited about all the produces that start to appear in the farmers market. I told you before, summer always seems like a marathon for me. There are just so many things I like to cook with and preserve which I don't get the time to do half of them. Out of all the produces summer has to offer what excites me the most are tomatoes. Nothing beats the taste of freshly picked in season tomatoes. 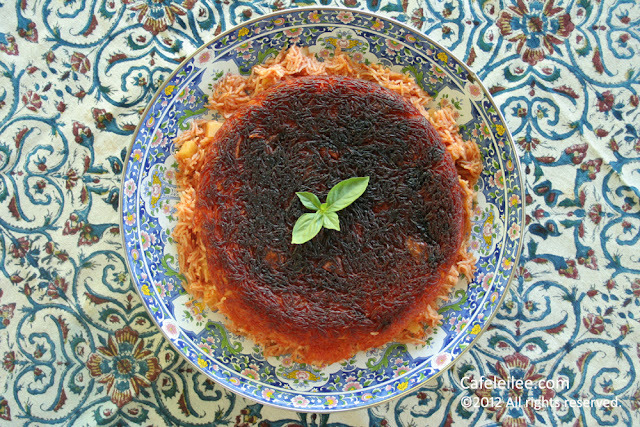 Besides the Marinara sauce, and the Persian tomato omelet what I crave for in the summer is the taste of kateh gojeh farangi. The juice from the tomatoes help cook the rice and what remains of them is the concentrated flavor of tomato which compares to nothing you have ever tasted. This rice dish is also known as Istambuli Polow, the name Istambuli Polow refers to the kind of potato normally used in this dish known as Istambuli potatoes (which are known as fingerling potato in the U.S.). Given that the rice is cooked in kateh style and not polow style*, I decided to call it kateh gojeh farangi (gojeh farangi meaning tomato). 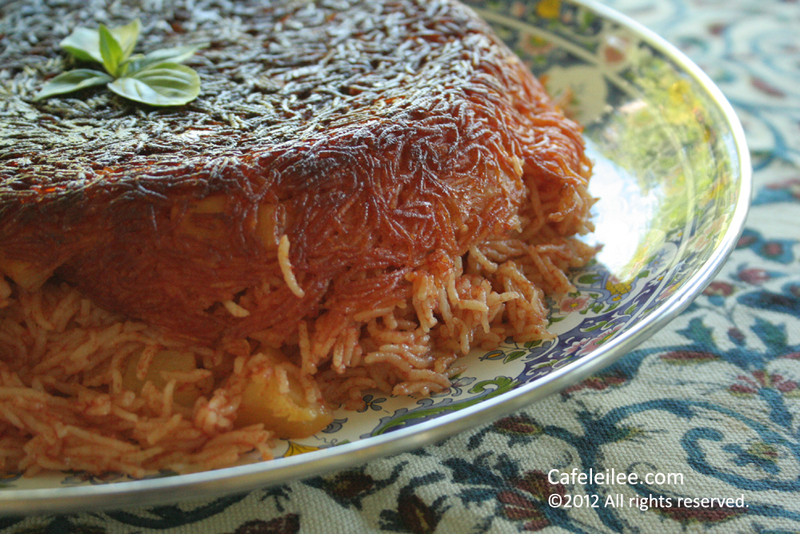 *For more information on different styles of cooking Persian rice click here. Crush the tomatoes in a food processor or blender and run the juices through a sieve to extract the seeds. Place rice in a large bowl and cover with water. Agitate with your hand, and avoid breaking the rice grains, then pour off the water. Repeat this 3 to 4 more times until the water is clear. In a large non-stick pot soak the drained rice with tomato juice. Add salt and potatoes. Dissolve the tomato paste into one cup of water and add to the rice. Let the rice soak in the tomato juice for 2 to 4 hours. In the meantime fry the onions in 4 tablespoons of vegetable oil until golden brown. Place the rice pot over high heat until it starts to bubble uncovered. Reduce the heat to medium high and stir frequently. Once the rice has absorbed most of the water and there's just a little water at the bottom of the pot add the fried onions stir quickly and pour the vegetable oil over the rice, reduce the heat to medium and cover. Let the rice steam for about 10 minutes, then reduce the heat to medium low, remove the lead and cover the bot with a clean towel or 3 layers of paper towel and cover with the lead firmly. Let the rice steam for 45 minutes longer, then invert into a platter. تابستون برای هر کس یک معنی داره. بعضی ها به ساحل هجوم میبرن و اون هایی هم که فرصت ساحل رفتن ندارن به بالا پشتبون میرن تا پدر پوست بیچارشون رو در بیاران. بعضی ها هوای خوب رو غنیمت میدونن و شروع میکنن به سفر کردن. یک دسته هم مثل من دستهاشون رو به هم میمالن و منتظر محصولات خوشمزه تابستون میشن. قبلا تو این بلاگ گفتم که تابستون برای من مثل یک مسابقه دو ماراتون هست که همش باید بجنبم که با همه محصولات غذا و کیک و شیرینی و مربا درست کنم. تو تمام محصولات تابستون چیزی که از همه بیشتر براش هیجان دارم گوجه فرنگی هست. هیچ کدوم از گوجه فرنگی های باغچه کد بانو به هدر نمیره. به غیر از املت و سس مارینارا، این کته گوجه فرنگی جزو غذاهای محبوب تابستونی کافه لیلی هست. برنج با آب گوجه فرنگی پخته میشه و چیزی که از گوجه فرنگی میمونه طعم تغلیظ شده گوجه فرنگی هست که به هیچ وجه نمیشه با چیز دیگه ای مقایسه اش کرد. کته گوجه فرنگی بیشتر به نام استامبولی پلو معروف هست، به احتمال زیاد به خاطر اینکه سیب زمینی استامبولی توش استفاده میشه. ولی از اونجایی که طرز پخت این غذا به روش کته ای هست نه پلو من تصمیم گرفتم کته گوجه فرنگی خطابش کنم. برنج را بشویید و آب اضافی برنج را جدا کنید. رب گوجه فرنگی را در یک پیمانه آب حال کنید و محلول را به همراه آب گوجه فرنگی، نمک و سیب زمینی به برنج بیافزایید تا برنج با آب گوجه به مدت ۲ تا ۴ ساعت خیس بخورد. در یک قابلمه نچسب مناسب برنج را روی حرارت زیاد به جوش بیاورید (بدون درب) سپس حرارت را روی متوسط تا زیاد بیاورید تا بجوشد در این مدت هر از چند گاهی برنج را هم بزنید تا ته نگیرد. چند جوش که زد و آب تقریبا تبخیر شد، پیاز داغ را اضافه کنید سریع هم بزنید و روغن را به برنج اضافه کنید و حرارت را روی متوسط بیاورید. در قابلمه را بگذارید تا برنج بخارکند. بعد از حدود ۱۰ دقیقه حرارت را ملایم کنید و در قابلمه را با دم کنی یا حوله تمیز بپوشانید و روی قابلمه قرار دهید. برنج بعد از حدود ۴۵ دقیقه دیگر حاضر است.